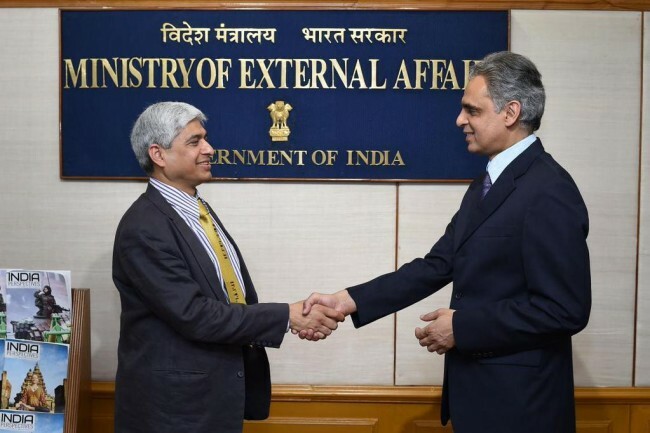 New Delhi, April 18 (IANS) The photograph of Vikas Swarup, the external affairs ministry’s new spokesperson, now adorns the Twitter account of the ever-busy handle @MEAIndia. The handle, which till late Saturday afternoon had the photograph of popular spokesperson Syed Akbaruddin, was replaced with Swarup’s, who formally took over on Saturday. “Thank you Akbar!!! A new inning begins for me. And some big shoes to fill,” was Swarup’s first tweet, with a photo of the two officials shaking hands. The Twitter handle, which has 8,486 tweets, and 313,000 followers, has become a handy tool for information on the latest news and developments with regard to India’s foreign policy and the prime minister’s tours and speeches, among others. Akbaruddin, who takes over as the chief coordinator of India-Africa Forum Summit, made the Twitter handle extremely popular – tweeting photographs and latest events regarding any diplomatic visit, ministry event and news regarding India. The MEA website too has undergone vast changes under Akbaruddin, with latest developments in various missions and posts available at a click. Among the last few tweets posted by Akbaruddin on the Twitter handle before Swarup formally took over are of both the officials seated with Prime Minister Narendra Modi on board the special aircraft, with Modi directing his instruction at Swarup. Akbaruddin also clicked a selfie with Modi. “Last day at work usually provides rare opportunities. In my case, a selfie with an indulgent PM @narendramodi,” is accompanied by a photo of Akbaruddin taking a selfie with Modi on board the aircraft on way home after the three-nation tour. Akbaruddin, who is being promoted as additional secretary, will work as chief coordinator for the India-Africa Forum Summit, which is scheduled for October. Swarup, a noted novelist whose book ‘Q&A’ inspired the Oscars winning ‘Slumdog Millionaire’, is an Indian Foreign Service officer of 1968 batch. He was with the United Nations political division of the MEA. The MEA facebook page already has messages from fans of Akbaruddin, saying they will miss him. “I will miss Syed sir for sure and welcome Mr Swarup. I hope you hold public discussion on issues soon like Mr Syed,” posted one fan. “Heart-fully admire Mr Syed’s contribution in connecting us with MEA through all communication channels. Good Luck for the new role and challenge,” wrote another. Akbaruddin, who took over in 2011, is considered among the best spokespersons of the ministry and had a huge fan following on social media. He helped make the ministry approachable to the common people through social media. The ministry also began translations of its releases in other regional languages as part of its wider outreach.